The IMMF participated at the launch of the inaugural Spanish music conference – BIME in Bilbao on November 19th and 20th . 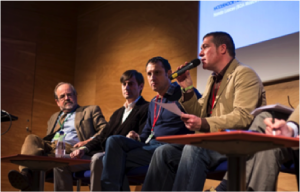 The attendance of over 800 delegates proved that Spain needs a conference like BIME. The IMMF took advantage of this showcase opportunity in initiating MMF Spain. Patricia Hermida and Natalia Talayero provided an MMF Spain presentation that was highly appreciated among the delegates generating a very positive feedback at all levels of the Spanish Industry. Zakład szklarski oferuje szkło i wyroby szklane.Szklarz w Piotrkowie Trybunalskim gwarantuje profesjonale usługi szklarskie w niskich cenach.